Comet 211483A Puck Kit for Ribbed Cover 94C Duster. 3-Pack. Home > Comet Clutches and Parts > Comet 211483A Puck Kit for Ribbed Cover 94C Duster. 3-Pack. Comet 211483A Activator Puck Kit for Ribbed Cover 94C Duster. 3-Pack. Comet 211483A Puck Kit for Ribbed Cover 94C Duster (high load use). Sold as a package of (3). Replaces OEM Comet KIT-WDG WGT 1 INS BLACK. Ribbed cover puck kit for complete unit 211493A (and others) or ribbed cover part 211489A. Genuine Comet Industries part made in USA. Comet 211482A - 7/8" Steel insert, wedge puck for ribbed cover Duster 94C. Comet 211482A - 7/8" Steel insert, wedge puck for ribbed cover Duster, 94C Puck, Sold as �3 pack�. Comet Industries 211482-A. 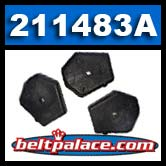 Comet 211477A - (3) Pack of 94C Wedge Activator Pucks. Solid Plastic.